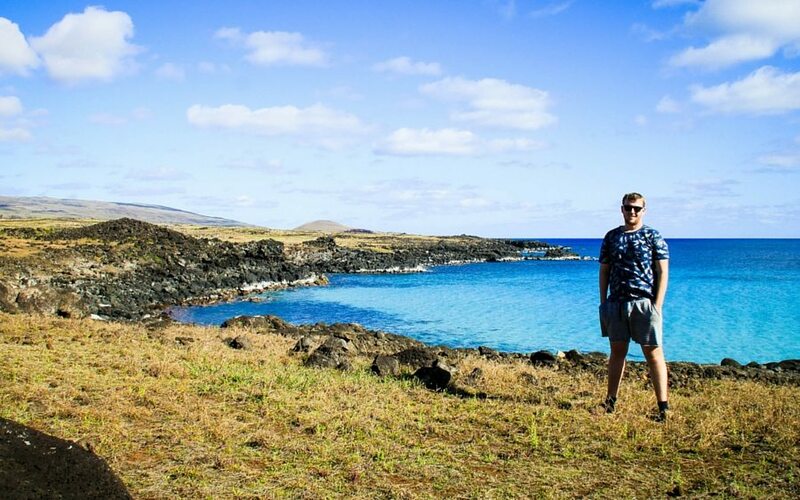 There are so many things to do on Easter Island I decided to make a helpful Easter Island travel guide after a recent visit to Easter Island (a.k.a Rapa Nui or Isla de Pascua), one of the most remote inhabited places on this planet. I was even more interested to come and see for myself! I mean I have been to some pretty remote places previous – Borneo, Iran, Georgia, Lapland, Cuba, San Blas – but this really takes the cake. If you are going to go all that way you should make the most of it so here is the top 10 things I think you can enjoy in Easter Island, a sort of mini Easter Island Travel Guide. Feel free to comment with alternatives or suggestions but please if you are going stay at-least 4 days to really enjoy this unique place! 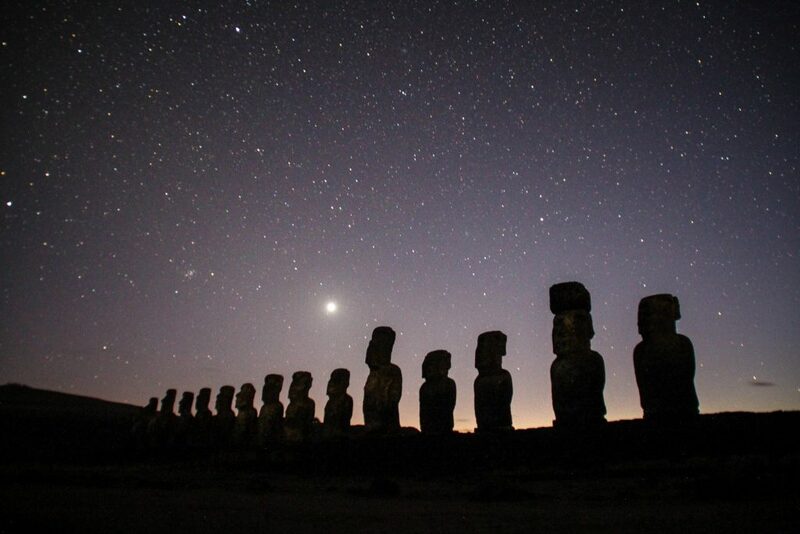 Where Is Easter Island Located? 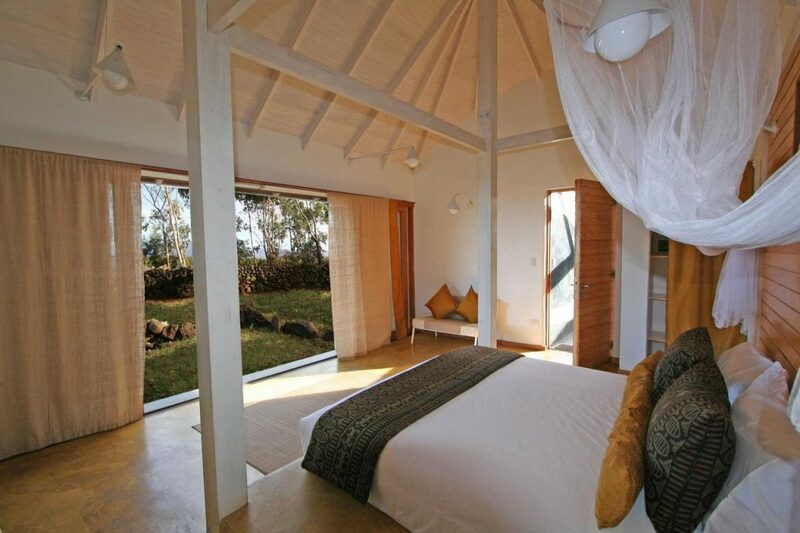 Where To Stay On Easter Island! 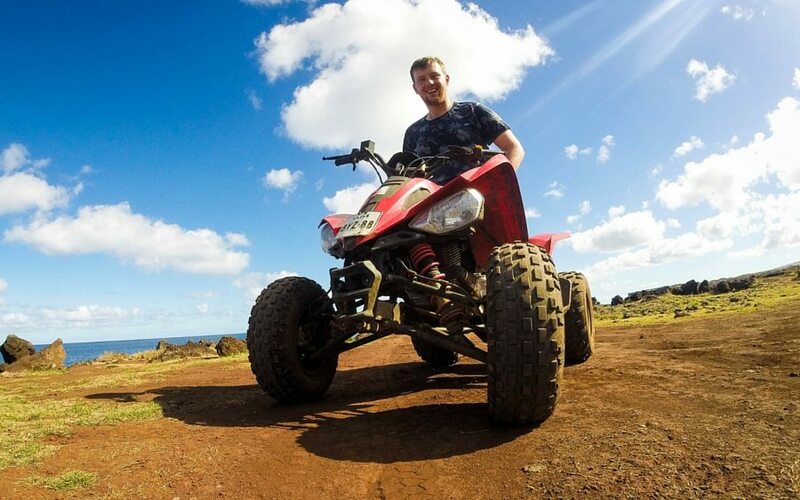 If you want to check out the island under your own steam (or have already taken a day tour but want to see the sights with less crowd) hiring a quad is 100% the way to go. You can get everywhere with these little bad boys and nothing like the freedom it entails and allows you to stop as you wish, and it is quite exhilarating. They are rented all over the island – I got mine for 30,000 CLP from my camping but I think the price is similar to Insular Rental on the main street. Best to ask some of the smaller places and negotiate if possible – 2 days would suffice. 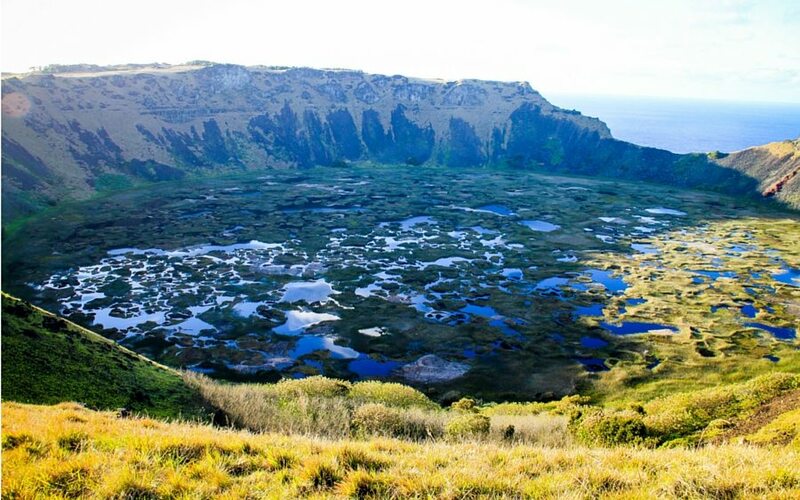 The crater of Rano Kau volcano from the viewpoint is impressive, best seen in the early morning light … A huge caldera that is now inactive and where the lava has been replaced by a lagoon with reed plants. These reeds interestingly enough are also found at Lake Titicaca giving credence to some interesting theories about contact with the Inca’s and their ‘kontiki’s’…. A perfect place to contemplate life, admire the scenery and experience one of the few ecologically wonders on the island. Easter Island only has three beaches but Anakena is “THE beach” on the island. 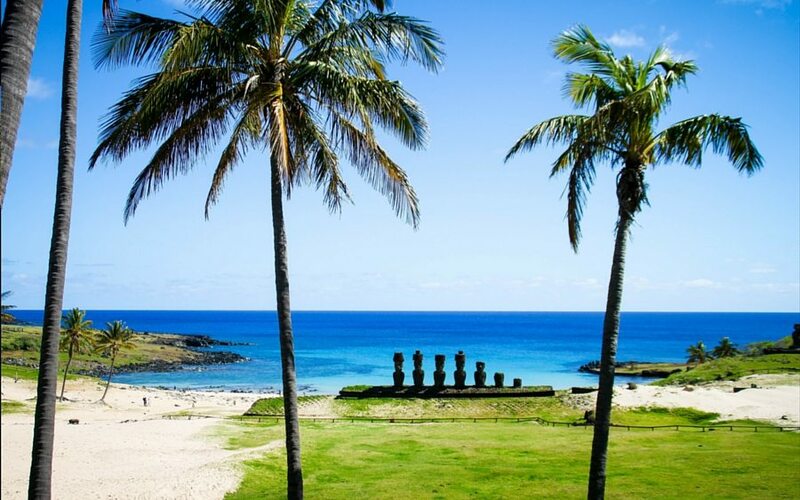 Surrounded by lush palm trees brought from Tahiti, fine white sand and crystal clear waters, is the perfect spot to relax and enjoy views of the ever present moai. Perfect place on the weekend to stop when resteraunts are open (only ones on the cirle island route) with nice fit out and decent prices on sandwiches and empanadas. 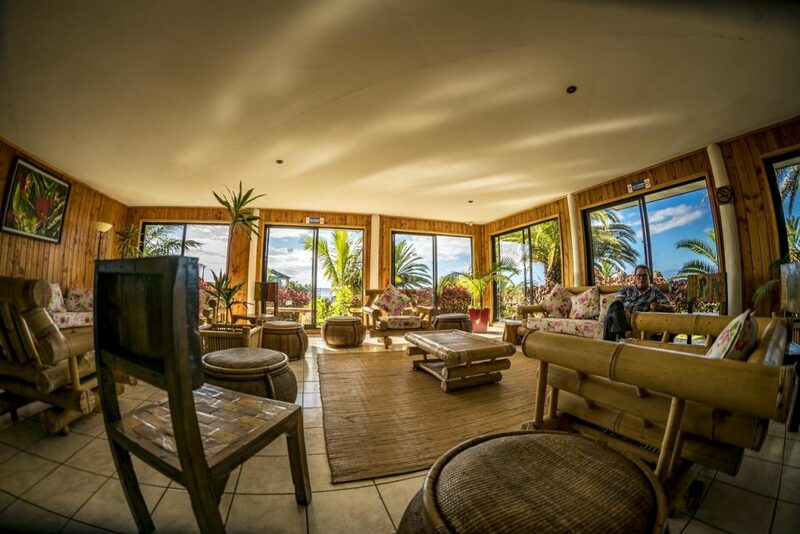 According to island oral traditions, Anakena was the landing place of Hotu Matu’a, a Polynesian chief who led a two-canoe settlement party here and founded the first settlement on Rapa Nui so this really is a special place not to be missed! 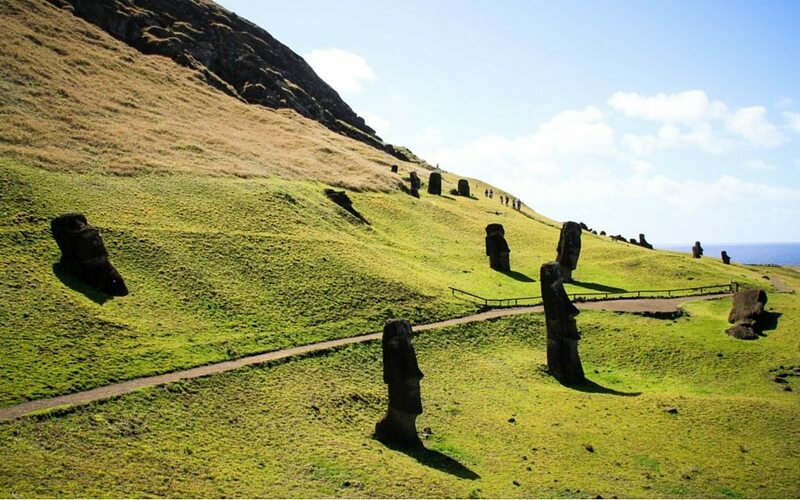 Ahu Tongariki is the most spectacular platform of Easter Island and absolutely not to be missed. While you can view it at any point on a circle island tour in the morning for sunrise is when it absolutely shines as the sun rises behind the Moai. 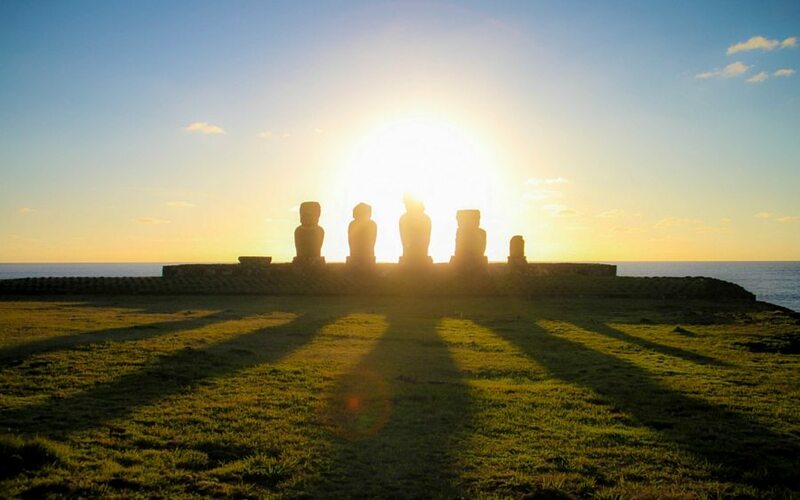 For maximum effect visit between the 21st of December, the “Summer Solstice”, and the 21st of March, the “Autumn Equinox”, the sun rises behind the Ahu, between its giant stone sculptures, creating an unforgettable sight . Its isolated location, the nearby Poike volcano and the waves of the Pacific Ocean crashing behind it, give an air of majesty and mystery unmatched. Watching the sunrise behind its 15 Moais, oriented to Rano Raraku volcano, is unforgettable and almost a religious experience, making you truly consider your place in the word. Tahai, just along the coast from Hanga Roa, is possibly the best place to watch the sunset after a hectic day exploring the island. The set of three ahus is located in a peaceful waterfront meadow where you can watch the sunset behind the statues. It is popular with local and tourists alike and nice to see people having a picnic and just enjoying being together, a great spot to people watch and just being 15 mins walk from town its perfect to do on the first day after flight into island if you are feeling exhausted but still want to get your first glimpse of the Moai. 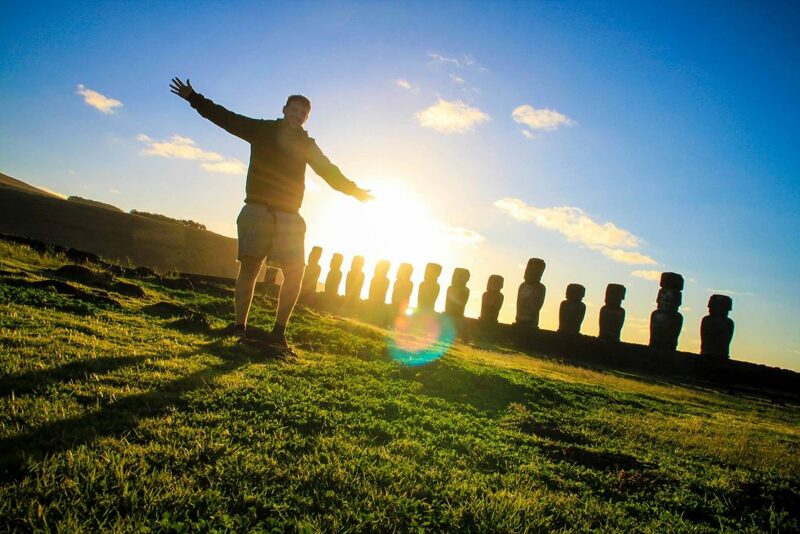 Did you know the Moai and the Rapa Nui National Park are a UNESCO World Heritage Site? I’ve now been to over 250 – You can see the full list here! Or check out this article: Travel Blogger’s Favourite UNESCO Sites in South America. 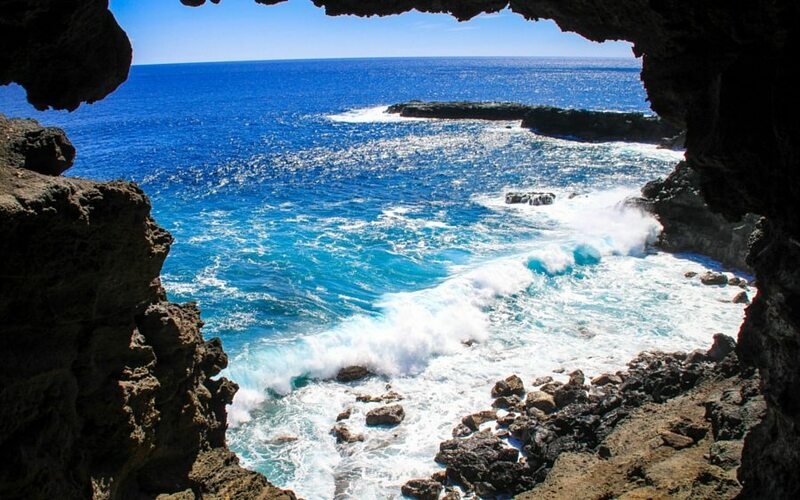 Because of the volcanic nature of Easter Island, it is blessed with dozens of caves caused by lava tubes created by volcanic eruptions that shaped the island. Ana Te Pahu or Cave of the Bananas is one of its best caves and found on the dirty path marked on most maps going up from Ahu Tahai, one of the most secret or least explored parts of the island – Within it the lava left several openings where sunlight is filtered creating small nurseries for plants, something quite unique just be sure to take a torch. On the same path is possibly one of the islands best and most under-rated attractions – The cavern of the two windows (Ana Kio) in front of the Motu Tautara (there is a sign but nothing is written on it). A lava tube emerges from the land near the cliff. Sliding through a narrow entrance you enter a large cavern that offers two exits in the middle of the cliff, one towards the sea, and the other towards the Motu Tautara…Words cannot describe its beauty but you must check it out, if in doubt ask your hotel for help and then people again on the trail as is easy to miss! Be sure to bring a torch – an essential item on any long-term backpackers list – since, well, this is the middle of nowhere and your chancing of being able to garner any forgotten bits locally is slim-to-none! 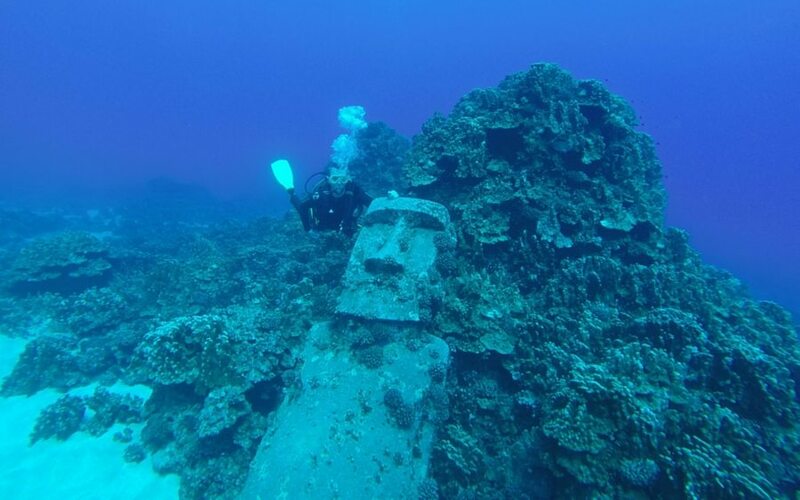 Literally walked straight off the plane to the Easter Island dive centers (Orca Diving Center to be exact) and said “Take me scuba diving with the underwater moai” … it really was a must have a photo for me! For more amazing diving check out my guide to the best dive sites in the world that I’ve been to! You will find the postcard images of Easter Island here, the half buried Moai in the slope of Rano Raraku volcano buried by sediments over time. 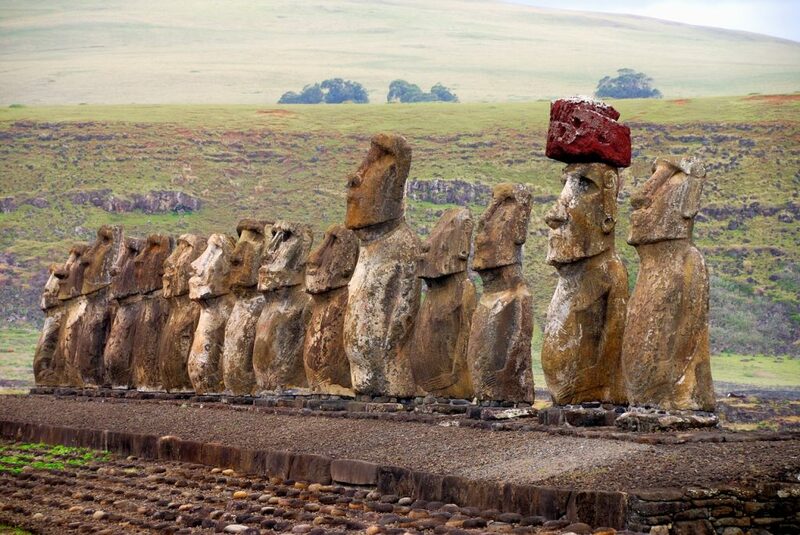 Most of the Moai left here were too damaged, imperfect or big to be transported elsewhere so where just left. Here you can see the largest Moai ever and variations of earlier Moai unearthed during digs. 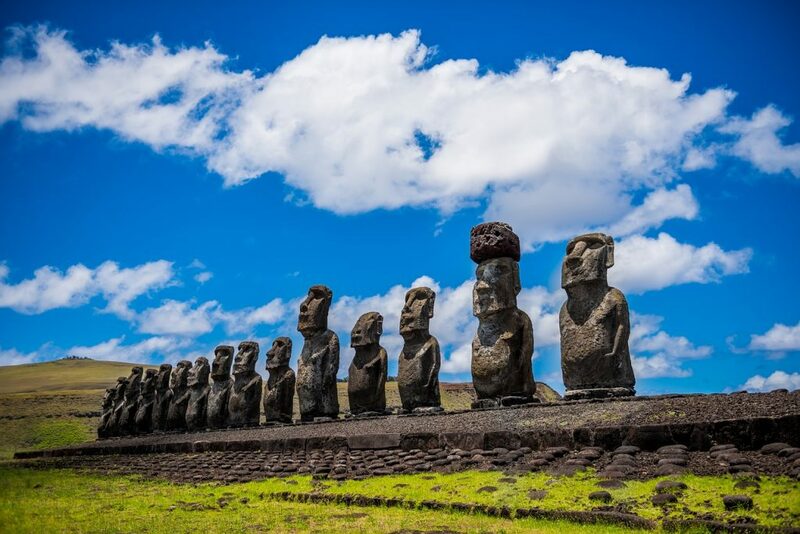 This quarry was used by Rapa Nui for carving and extracting these colossal statues, and a whopping 96% of them came from this location! If you make it to Colombia while you here don’t miss the other most famous stone statues in South America at San Agustin! 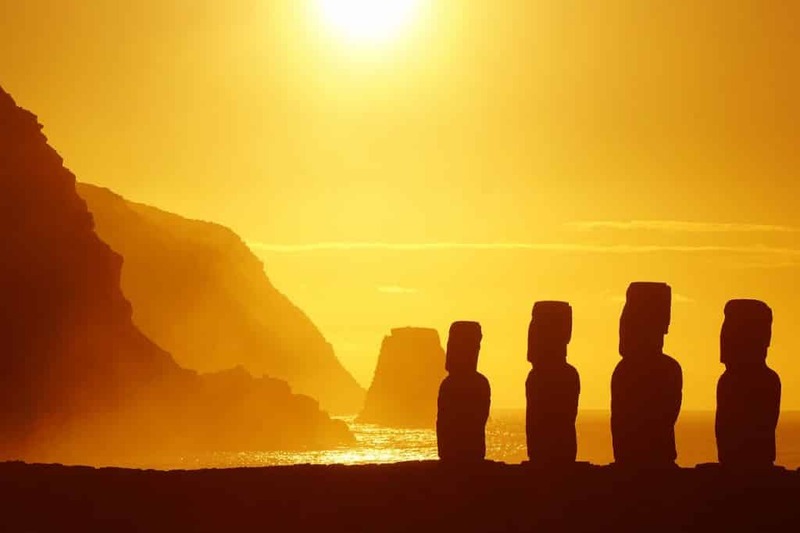 While Easter Island is indeed expensive compared to mainland Chile and South America in general it should be considered how raw, rugged and isolated this rock is. Expect to pay more for big western brands here. That being said there are some good bargains to be had and for me the three food highlights of this island were Kotaro, Te Moana and Empanadas Tia Berta. Kotaro is an amazing Japanese restaurant (#1 on Trip Advisor) run my a one man band with some the best food I have had anywhere in the world – Expect a unique experience the will have you going back for more (and it near airport so can go for dinner after check in if flying on to Tahiti). 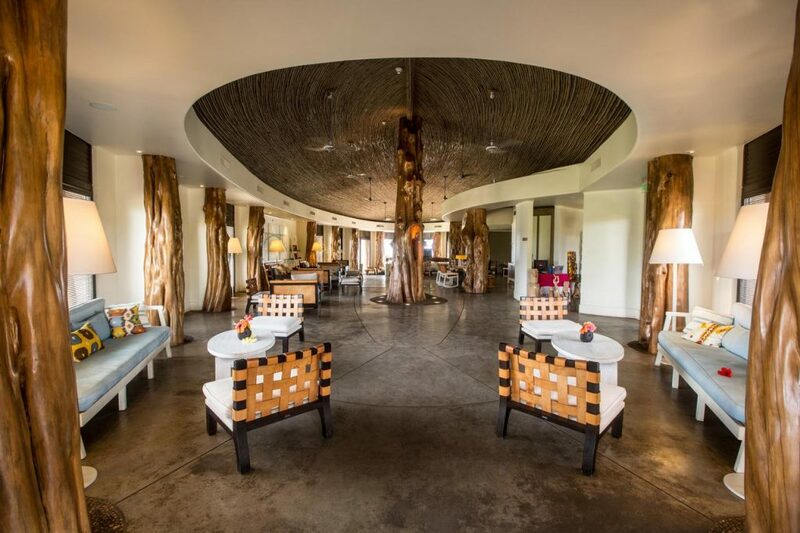 Te Moana (pictured) is a more local style place – upscale but only a tad more than other places on the island – The sunset here is incredible and so are the cocktails so would do will to join together. Finally when costs are mounting Empanadas Tia Berta on the main street is the best place to go for a delicious and cheap lunch – 3000 CLP for a massive empanada with tuna and cheese and your set. This kind of matches up with number one (Quad) but with Easter Island half the fun is enjoying and appreciating the wild and diverse coastline in this little rock and really appreciating how isolated it is. I stopped for lunch in a random site with a view and had it all to myself but even just enjoying a ice cream walking along the coast line in Hanga Roa would suffice. just don’t take the coast for granted here as it really is a highlight – Wind swept shore lines with jagged volcanic rocks being battered against the relentless waves 24/7 .. oh gives me the chills a little to even think about! 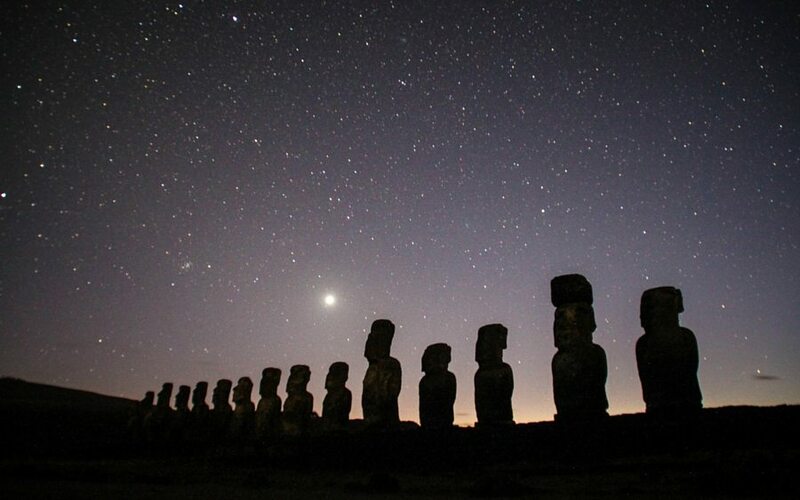 Easter Island, as you have probably figured out by now – is one of the most isolated islands on Earth. So the simple answer to where is Easter Island locations is: in the middle of the Pacific, far, far away from everything else. If you want to get technical it is roughly halfway between Santiago de Chile and Tahiti, just plug in 27.1127° S, 109.3497° W to your GPS and start swimming. Even given Easter Island’s extreme geographic isolation, it’s not as hard to get here as you would imagine. Everyone I have spoken to about things to do in Easter Island has said “Wow, it must be so difficult to get to Easter Island”, but really it isn’t. It is just that options are limited and might not be very cheap. There are regular flights thanks to LAN Chile from Santiago de Chile and one per week to Tahiti. A few boats stop by during the year on commercial ship routes, but even the most intrepid travelers are going to struggle to get on these. 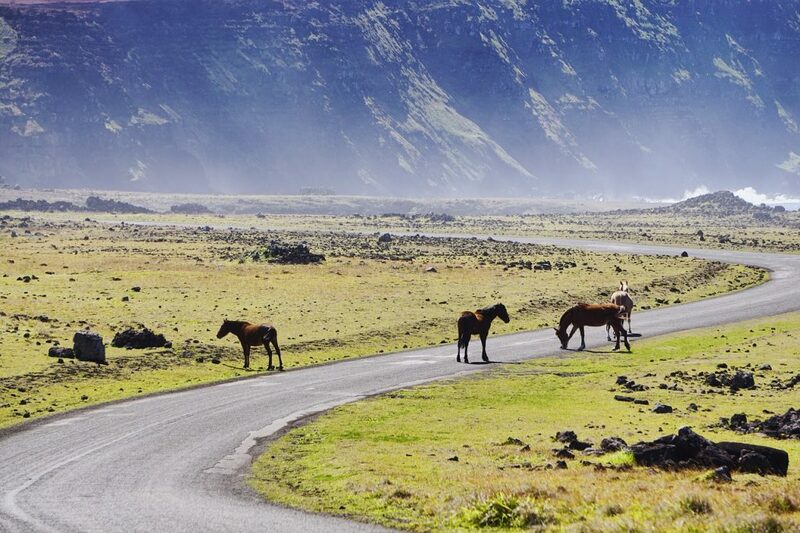 Our recommendation for getting to Easter Island? Do it on an RTW trip when it becomes for affordable, or use Skyscanner to look for cheap return flights from Santiago de Chile. Flight time is around 5 hours, so you will want to stay a few nights minimum. 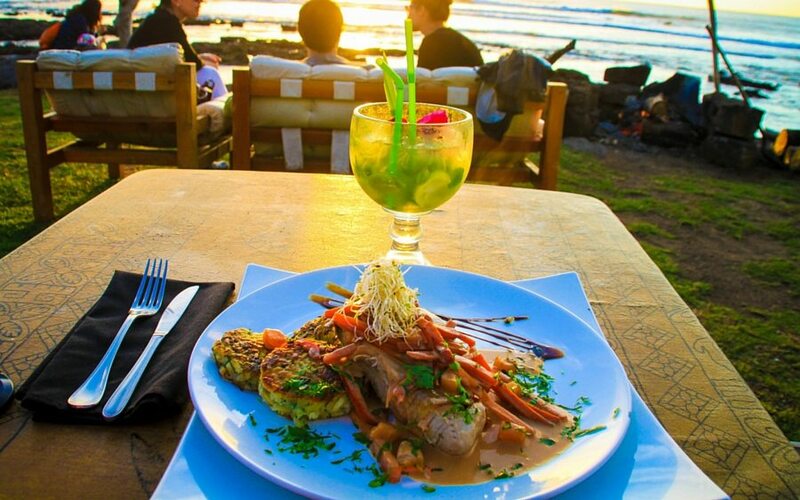 Discover all there is to experience at Hangaroa. From spacious rooms to a relaxing spa and gourmet cuisine, the choices are yours! 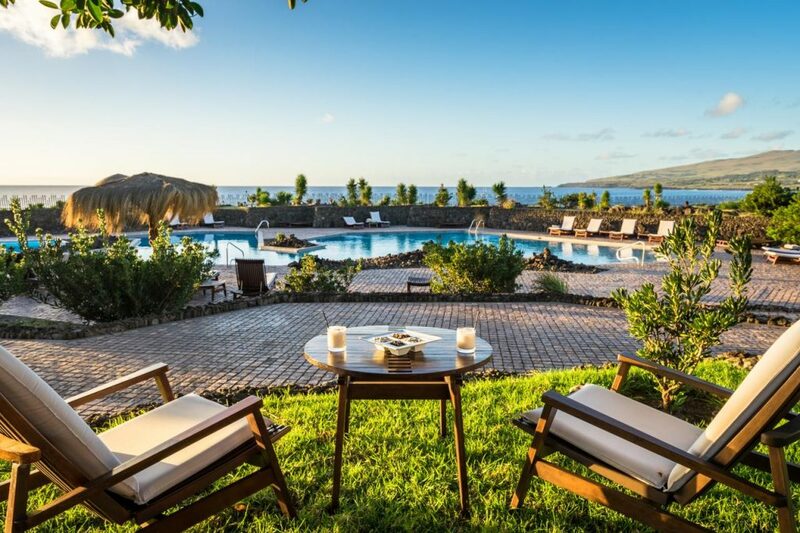 Set on a property of 1.5 ha the hotel has a panoramic view of the shoreline, luxurious gardens, a beautiful swimming pool viewing the sea and large open spaces to relax. An outdoor swimming pool and bungalows surrounded by gardens can be enjoyed in Hanga Roa only a 5-minute drive from Mataveri International Airport. Wi-Fi is free in public areas and breakfast is included. Now you're all set and prepared to explore our big wide world, why not sort out everything else out all in one go? If necessary for your travel plans make sure you have brought proper travel insurance, protected your privacy by getting a secure VPN, compared all the top hotel booking sites to find just what you're after, reserved an unbeatable rental car price and - of course - booked the best flight deals! Or maybe just forget it all and go for a last minute cruise or effortless tour instead? Many budget travelers (including me) indulge in worldwide airport lounge access, so we can experience luxury while still slumming it in economy. Naturally, we would never leave home without a more a more general travel guide since we couldn’t possibly cover everything here! Just add an adventurous attitude and plenty of smiles - they go a long way - and that about covers it all! Now go out, find your own path and don't forget to share your best inspiration stories with me on Facebook, Twitter, and Instagram...I'd love to hear from you! I want this site to help you to learn more about the world and to discover quirky attractions and destinations. Hopefully, I can show you how easy it is to make your own adventure – whether its a weekend city escape or a multi-year odyssey. Just pull out your map, get inspired and GO! As an Amazon Associate Inspired By Maps earns from qualifying purchases. Other affiliate programs linking to recommended products and services are also used. Any and all access or use of this site is at the risk of the user. Inspired By Maps is not liable in any manner whatsoever for any direct, indirect or consequential damages arising out of the access, use or inability to use this site or any third-party website. © 2018 Inspired By Maps. All Rights Reserved.